I spend a lot of my time online and in my ramblings, I come across some weird stuff. I started my first blog in 1995 and I’ve been through pretty much every platform that you can remember, searching for cool stuff, but I found something the other day that made me stop. It was in a friend’s Tweet and it was just a link to a book. I thought, well, what the heck and went to take a look. Here’s the cover image from the sales page. It doesn’t look like much and at first, I blew it off and didn’t get into it, but it stuck with me all day, until finally, I had to know what was in it. “No, no one knows who did, and it’s great stuff. Exactly what I needed to hear!” was all she would say. She refused to reveal the contents, because her “future self” had asked her not to, in the book! Crazy, right? So, finally, I was laying in bed and I got to thinking about it again and finally, I just got up and bought the damn download. It’s not very big, but she was right, it was what I needed to hear. In fact, if I had time, I’d read it before starting each day, and if the author ever puts out an audio version, I’d buy it in a heartbeat so I could play it over and over. So, I’m not going to tell you what’s in it either, but here are some observations about this clever marketing. If a book cover can do that, it will eventually sell. 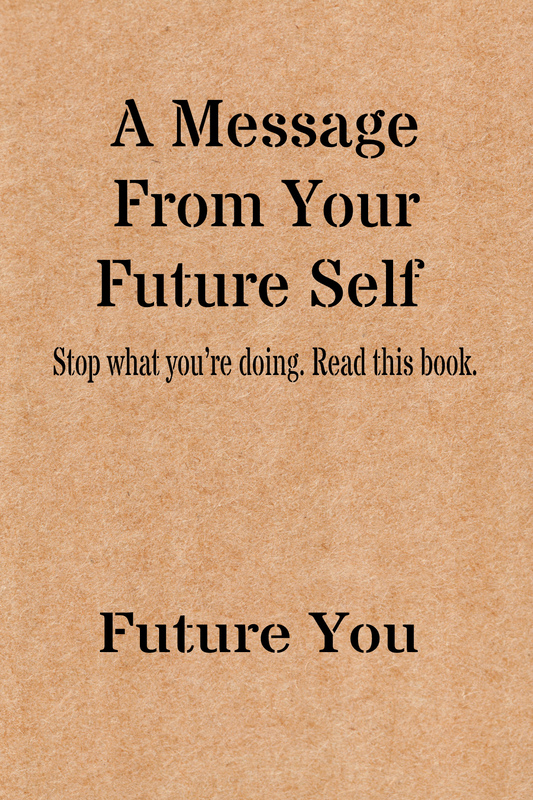 If your covers are boring, or stiff, or just like every other cover, meh, I might read a couple of pages, but this brown paper wrapper, and plain text, claiming to be written by “Future You” was absolute genius. The writer didn’t say anything controversial, but it was kind of mind blowing, the way it was put together and it really made me want to suggest other people should read it! So, I did. I don’t know who is selling all of those books, but I’m happy to send people there, because it really spoke to me! Sure, the description hints at good stuff inside, but there was no way to be disappointed by the content, because no promises were made regarding it’s brilliance, or anything else! I’m always cautious if a book tells me everything I want to hear on the cover, because I’ve been disappointed too many times. It’s kind of viral, if you think about it. The damn thing stuck in my head. It would not let go until I found out what was in it, and I’m glad I did. Now, it’s not earth shattering, but, it was like the best pep talk, confidence booster and personal life affirming speech I’ve ever heard, all rolled into one. I think the simplicity of the message is the key! There’s only one down side. This author, whoever they are, didn’t leave any trace. In/out, woosh. I’d love to read more, but they left me hanging. I did leave an email, so maybe that will reveal something. I’m hoping it’s not just a one time thing somebody tried and then abandoned when it didn’t sell a million copies overnight. Although I hate “click bait” (mostly because it never quite delivers) I do need to be more intentional to build some curiosity into my offers. In fact, a lot more intentional. I’ve gotten complacent, and it’s showing in my sales. If I don’t connect with people on a deep level, nothing is going to happen. This author would definitely get my $2 again, (actually, I got it for $1 because I shared it, why not?) because they made a connection. So, if you get the book, or find out who it is, would you please tell them thank you for me? Don’t tell me who it is! Of course, if it really is from my future self, I’ll know eventually, I guess, right? LOL anyway, it’s worth a look, and hopefully you can get some good ideas from it like I did. Or, get my books, including several on writing, and inspiration, from my store. This is by far one of the strangest, yet most effective pieces I have seen published here. I was initially confused, but something kept me glued to the article. And guess what? By the time i was done reading, I had also downloaded the damn book. Absolutely! I love looking into new ideas and definitely have a thing or two to suggest. I’ll shoot you a quick email this week. Thanks, it’s all about trying to wake people up to who we really are in this world, and our own power to see the world we want, if we work for it in our own lives and help others do the same. You’re the man, Ryan, thanks for the never-ending support!